pH is a well known scientific term in today’s culture. We constantly hear about bath soaps and shampoos being pH balanced. However, as rosarians, we need to understand it a bit better than most people since the health of our roses depends on it. In chemical terms water is made up of two components known as ions. One of the ions in water is hydrogen (written in chemical language as H+. The other component is the hydroxyl ion (written in chemical language as OH– . One of these ions has a positive charge and the other has a negative charge. Because of these positive and negative charges any solution displays some electrical activity, and it is this property that makes possible pH measurement with a meter. In simple terms the pH of a solution (or soil) is a measure of the hydrogen ion concentration. pH 0 is very acidic. pH 14 is very alkaline (another term for this is “basic”). pH 6.0 – 6.5 is the pH for best rose growth. One unit of pH is 10 times more than another unit because the scale is logarithmic. Do not worry about how hydrogen ion concentration gets converted to pH, just be thankful some smart scientist figured this out, and all you have to do is read the meter. The soil you start with in a rose bed has pH and contains some chemicals. The soil pH and chemical composition changes as a result of fertilizers and other goodies you add. pH is important because when the value strays from the 6.0 – 6.5 range, many of the nutrients (chemicals) roses need for proper growth become unavailable (the plant roots cannot absorb them). One picture is worth a thousand words. 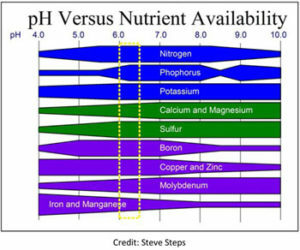 The table shown, “pH Versus Nutrient Availability”, is taken from the Consulting Rosarian Manual and is a great picture of the importance of the proper pH. For example, many nutrients are still available at a pH of 7.5, but look at what happens to iron and manganese which are so important to chlorophyll formation and other crucial functions. They decline in availability about 100 times for each 1.0 increase in pH. The CR Manual also says that though aluminum is not needed by roses, it can cause serious toxicity problems if pH goes below 5.5. So it is very obvious how important pH is to roses and plants in general. My lab background of testing and adjusting pH in solutions — an almost daily occurrence — drove me crazy when I first started trying to test my rose bed soil. It quickly became obvious that pH values of “dirt” were difficult to obtain and sometimes not easily reproducible. So the rest of you obsessive compulsives like me, prepare to accept some variability. If you only have a few roses and do not want to invest in a meter, then select some soil samples from different parts of the bed. Mix them together well and send or take them to your local county extension agent. In Nashville, that is at Ellington Agricultural Center. There the UT Extension Service soil testing division’s phone is (615)832-5250. This will get you not only the pH, but a general soil test which you should do anyway. They will also suggest remedies for any problems. For rosarians with many roses, a pH meter of your own is a must. You get what you pay for when choosing one. A $20 meter is highly unlikely to work well. The Kelway pHD is an excellent meter and is available from a number of online sources. I purchased mine from Rosemania.com for about $70. It works well if the directions are carefully followed and it is easy to use. Also, no batteries are required for it. Be sure that the soil is moist when you check it. That is very important. When you have your own meter, how should you test? Should you pool samples as for the small garden or test each rose in the bed? If your roses are all doing well and treated the same, by all means just pool several samples, test and be done. In my own garden with two beds of 45 roses total, I decided to test at every rose one fall as I was feeding them some organics. One bed was consistently 6.4 – 6.8, but the other, an older bed which was less well prepared when it was built, was more in the 6.0 range except for one rose which was 5.8 and another which was (oh, the horror!!) pH 4.1. Though I may never repeat this extensive sampling, it was nice to have such specific information. Certainly you want to test any individual rose that is not thriving. How could two roses be so different from the rest of my 45? Quite frankly, I have no idea, but I know that I am not the only one who has run across this situation. Generally speaking, chemical fertilizers make soils more acid so before pH testing was readily available to home gardeners, most rosarians routinely added lime to their soil. Now we can go more high tech and determine what is really needed. Lime is the chemical of choice to raise pH. Most of the soils in middle Tennessee are slightly acidic so raising the pH is a requirement. Both the Kelway meter instructions and the UT Extension service recommend “dolomite limestone” which is pelletized and has magnesium in it as well as calcium. If you are routinely adding Epsom salts for magnesium, you may add just calcitic limestone which does not contain magnesium. Both types come in 50lb. bags available at reasonable cost at co-ops and garden supply stores. Either product is slow acting (2 – 3 months) and you cannot expect extremely rapid change in pH, so be patient. So if you want to raise the pH in your bed for spring growth, be sure to add lime in late winter or early spring. and be sure the lime is well worked into the soil. Do not use “burnt” or “quick” lime. It works quickly but can burn both you and the roses. Sulfur is the chemical of choice to lower pH. Since sulfur is used less often than lime, it is difficult to find smaller bags than 50 lbs. at the co-ops, but check the larger garden centers before you have to buy the huge amount or try to share with a fellow member (thank you, Bob Bowen, for mine). How much lime or sulfur are used? Here is the annoying part for me: I decided to write this article to answer questions that I had wondered about in the past and to figure out how much sulfur or lime was needed for a couple of bushes with high or low pH. My lab background again reared its demanding little head and asked exactly how much to use per bush. Sulfur is the easiest to figure out since it is elemental sulfur, meaning it is the pure stuff, and comes as a powder or as very small pellets. UT Extension Service says to apply 0.2 lb of sulfur per 100 square ft. for each 0.1 unit that the pH is above 6.5. Good grief, I only want to treat one rose bush! ( I found this same amount to add in some old pH meter instruction manuals so this seems to be reasonably standard advice.) You should also add 1/3 more for clay soil and 1/3 less for sandy soil, but since most rose beds are probably medium textured, I stuck to the standard recommendation. So I weighed one cup of the sulfur I had and found that it weighed about 0.5 lb and I decided that the area around my rose bush was about 4sq. ft. After checking my calculations a dozen times, I came to the conclusion that for this package of sulfur 0.2 lb/100 sq. ft. equates to applying about 1 tsp./4 sq.ft. to lower the pH one tenth of a unit per rose bush. That certainly is not very much but gives me a starting point once I multiply by the amount of pH change I need to make. If the pH needed to be lowered even more, say one whole unit from 7.5 to 6.5, then I would need about 3.3 tbls/4sq.ft. As to lime, that proves to be a different kettle of fish. Depending on which lime purchased and what brand, it can range from neat tiny pellets to a heterogeneous mixture of light and dark lumps. I had some of each and weighed them and they both were about 0.5 lb/cup. The problem here, when trying for accuracy in the amount to add, is the variability found in the many sources I read. The bags themselves generally have some sort of recommendations as to the amount to add, but the best value I found was again in the CR Manual which gives a range of 4.6 ounces/rose bush in sandy loam to 13.2 ounces/rose bush in clay loam to raise the pH one whole unit from 5.5 to 6.5. That would make the old standard of 1 cup/bush a reasonable value to go by if we assume most rose soil is somewhere in the middle between a sandy and clay and assuming also that the area I chose of 4 square feet is close to the CR Manual’s rose bush area. To make adjustments raising the pH less than a whole unit use 1.5 tbsp per tenth of a unit. As you have read above, this is not a very exact science, but at least I now have some general guidelines to use for adjusting the pH of the “dirt” around my roses. Good luck with your own! This article won the 2011 ARS Award of Merit for a newsletter article when it was in the Nashville Rose Leaf.